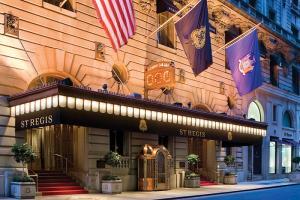 In the heart of Manhattan, a refined atmosphere and gracious service rank The St. Regis New York among the city's top hotels. Featuring dramatically renovated and redesigned guestrooms, suites, and public spaces along with the debut of the new King Cole Bar & Salon under renowned New York chef and restaurateur, John DeLucie, The St. Regis New York has unveiled a bold new era of glamour at Manhattan’s best address. An impeccable staff prides itself in far exceeding expectations. Located just 16 miles from the John F. Kennedy International Airport.